Cuba's leader Raul Castro "laments" the death of a detained activist who had been on hunger strike for nearly three months, its foreign ministry says. It marks a rare expression of sorrow by Cuba's leadership, although Mr Castro was then quoted as attacking the US. But the Cuban president insisted neither Mr Tamayo nor anyone else on the island had been tortured. "There are no torture victims, there have not been any torture victims nor have there been any executions," he was quoted as saying. "That sort of thing happens at the base at Guantanamo," he said, referring to the US detention camp at Guantanamo Bay. Mr Zapata, who was declared a "prisoner of conscience" by Amnesty International, had been refusing food in protest at jail conditions and died in the capital's Hermanos Ameijeiras hospital. Amnesty said "a full investigation must be carried out to establish whether ill-treatment may have played a part" in his death. The BBC's Michael Voss in Havana says Raul Castro's statement on Mr Zapata is unprecedented, although the Cuban leader went on to lay the blame for his death at the door of the US. According to the unofficial Cuban Human Rights Commission, about 30 dissidents have been detained over the past 24 hours in an attempt to stop them attending Mr Zapata's funeral, our correspondent adds. The international community has expressed deep regret at Mr Zapata's death. US state department spokesman Philip Crowley said it "highlights the injustice of Cuba's holding more than 200 political prisoners who should now be released without delay". He said US officials who were in Cuba last week for talks on migration had raised Mr Zapata's case and urged Cuba to provide all necessary medical care. The EU Commission offered its condolences to his family and said the issue of Cuba's political prisoners would remain a "key priority for the EU". Spanish Deputy Prime Minister Manuel Chaves said Spain deplored Mr Zapata's death, while a French foreign ministry spokesman expressed "dismay" and said France had urged Cuba to free him. Mr Zapata's death marks the first time in nearly 40 years that a Cuban activist has starved himself to death in protest at government abuses. The last political prisoner to die on hunger strike in Cuba was Pedro Luis Boitel, a poet and student leader, in 1972. Mr Zapata's mother, Reina Luisa Tamayo, has said she believes her son to have been "murdered" by Cuba's authorities. Mr Zapata was among a group of some 75 dissidents jailed by the authorities in 2003. He was initially sentenced to three years in prison, but this was increased to 25 years in subsequent trials after he was charged with disobedience and disorder in a penal establishment, London-based Amnesty says. 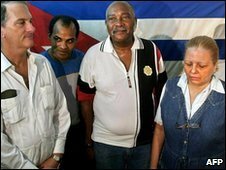 Cuba says prisoners of conscience are mercenaries sympathetic to the United States.